Sorry for the late post for this meal. Lewis made me some comfort food for celebrating that I finished exams last Saturday. 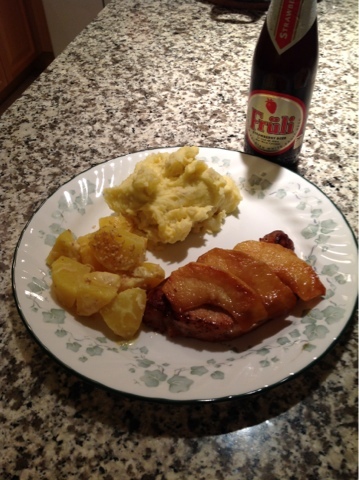 It was maple glazed pork chop with caramelized apples with his famous yam and potato mash and yellow beets as sides. The pork chop was a little over cooked but I think I would have suggested him to use the meat mallet to tender out the meat first if I was at home when he prepared the meal. It would have made it much much better. The caramelized apples are great, he makes these caramelized fruits with meals all the time, so I really don't know if they are a big hassle to do or not. His famous yam and potato mash never ever disappoints. This time he used a yellow yam, usually he uses a orange yam which gives it greater colour. But it still tasted the same, the texture is always great. Super light and fluffy. I'm hoping he can provide his recipe for the recipe page soon. So stayed tuned for that as well! Yellow beets are served cold just lightly mixed with butter and sesame. It was surprisingly good. I love purple beets, but Lewis finds them too sweet so we usually compromise with yellow beets. And we buy them whenever we see them in supermarkets. Overall, a great meal! Maybe because I was too tired and hungry after exams. And the strawberry beer...yum...my fav! What else goes better with comfort food than beer? !